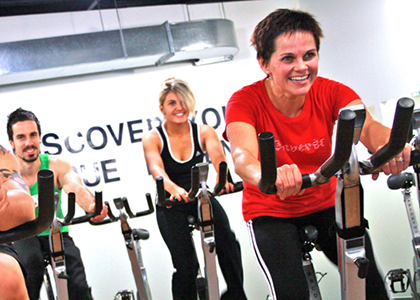 Spinning is a really efficient way to train whether you are a cyclist wanting a quality session during the winter months or you simply need a great fitness class. Here are our tips to help you get the most out of your session. Make sure you get to the class in time (ideally a bit early) to get your bike set up properly. To get the saddle height right, sit on the saddle with your foot on the pedal at its lowest point – in the right position your leg should be slightly bent. Check all positions not just the saddle height – the saddle moves backwards/ forwards to suit body length. You should be able to reach the furthest point of the handlebars with your arms still slightly bent and relaxed. Check the height of the handlebars, it should be in line with the saddle (unless you are pregnant in which case raise the handlebar for comfort). When riding you should have a relaxed upper body and bent elbow. Try and remember to loosen your neck and shoulders, as any tension will compromise your technique. This goes for your hands too. Relax them rather than grip the handlebar, try wiggling your fingers from time to time to remind yourself. There’s no point wasting energy gripping a bike that’s not going anywhere! Many people focus too hard on pushing down on the peddle and then relaxing on the return, the movement should be smooth and continuous. It helps if you tighten the toe straps or wear cycling shoes as that will enable you to ‘pull’ the pedal up and complete the cycle. It’s also important that you have enough resistance on the bike; it’s really hard to ride smoothly if each revolution is too easy, this can also create a jolting movement that feels out of control. This is neither efficient nor comfortable. When the going gets tough on a hill climb try shifting your position this will engage the muscles in a slightly different way and give you renewed strength. This change can be subtle, simply moving your hand position and altering the angle of your hips and torso can help. It’s up to you to set the resistance of the bike (how hard it is to pedal) so it can be tempting to keep it low and easy, but this is pointless. Firstly it’s really hard to cycle either fast or hard if the pedals are spinning. Secondly it will feel uncomfortable. If you are in a class where the teacher is continuously telling you to increase the resistance then you may end up reaching a standstill. That’s a sign of a poor teacher. Use your judgment. 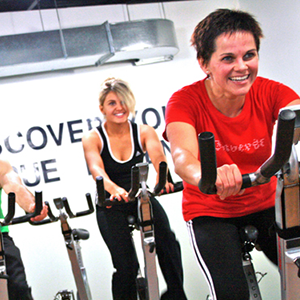 Once you get familiar with the bike and the class, you can work it to your own best advantage and enjoy a class that is custom-made for your fitness level. Enjoy!